Figure: Amp’d™ ELISA Signal Amplification kit from Enzo Life Sciences, Inc.
Enzo Life Sciences strengthens its position as an innovator of ELISAs with the introduction of a new ELISA amplification system, Amp'd™ ELISA Signal Amplification Kit, that provides up to 50-fold increase in sensitivity over traditional ELISAs. The Amp’d™ ELISA Signal Amplification kit is designed to replace traditional alkaline phosphatase substrates with a combination substrate and amplifier system that results in greater sensitivity when compared to a classic substrate ELISA. This increase in ELISA sensitivity provides detection of lower concentrations of target in samples, which is essential for difficult-to-detect analytes and is especially critical for many analytes in early diagnosis and treatment of various diseases. This new kit can be used with all immunometric format ELISAs where greater sensitivity is needed. The assay provides the reagents to replace the last step of a conventional sandwich ELISA, with minimal modification and no additional time required for a 10-fold increase in sensitivity. To achieve greater sensitivity, only longer incubation times are needed. Like many of our ELISAs, the Amp’d™ ELISA Signal Amplification kit is available in one or five 96-well plate formats for high throughput analysis. The kit is provided with an easy-to-use, simple procedure and results are obtained in just 30 minutes. With this new kit, users now have the flexibility to work with their own sandwich ELISAs with the added benefits of less-sample used and better detection their target of interest. The Amp'd™ ELISA Signal Amplification Kit is the most recent addition to Enzo’s industry-leading portfolio of products for ELISAs. 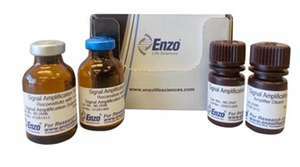 For more information or to order the Amp’d™ ELISA Signal Amplification kit or other Enzo Life Sciences products, please visit us at www.enzolifesciences.com or call us at 1-800-942-0430.